The Star & Hobnail, Russian, and Persian patterns are each formed by six intersecting sets of parallel miter cuts. The Star & Hobnail and Russian patterns always have octagonal hobnails; the Persian pattern, dodecagonal (12-sided) hobnails. The Russian pattern developed from the Star & Hobnail pattern and, therefore, it is illogical to consider the latter to be a variation of the former. Star & Hobnail was given unique catalog names by most manufacturers. In the past, and often today, only dealers and collectors use the name Russian Cleveland for this pattern. The Russian pattern was not named until 1881. Previously it was known as pattern No. 283, as cut at the Hawkes Rich Cut Glass company. The only difference between the Russian and Star & Hobnail patterns are the single stars that are cut on the hobnails of the Russian pattern. Traditionally, collectors have identified four main versions of the Russian pattern — Russian Canterbury, Russian Cleveland, Russian Ambassador, and the Persian variation of the Russian pattern. These names are used informally, however, and are not official names. Russian Canterbury is the standard Russian pattern with single stars on its hobnails; Russian Cleveland(now generically known as Star & Hobnail) has “clear” (uncut) hobnails; the hobnails in the Russian Ambassador pattern are cut with strawberry (fine) diamonds; and the Persian variation of the Russian pattern, sometimes simply called Russian-Persian, has hobstars or Brunswick stars on its hobnails. It should be noted that the Persian pattern, unlike the Russian, is not similarly differentiated. Its hobnails are usually cut with hobstars but other motifs can also be found. Because the Persian pattern is distinctly different from any of the Russian versions (including the Russian-Persian variation), it is an unique pattern. Like the Russian pattern and its variations it is formed by the cutting of six intersecting sets of parallel miter cuts. However, the spacing of these miters is different than what is used to form the Russian pattern and its variants. As a result, the pyramidal stars in the Persian pattern are always “boxed” with a four-sided figure (a rectangle which is usually a square) while the Russian pattern’s pyramidal stars are always boxed with an eight-sided figure, an octagon. These characteristics are immutable; they can, therefore, always be used to identify these two major patterns. The decoration found on a pattern’s hobnails does not, by itself, determine whether the pattern is Russian-Persian or Persian because, confusingly, both patterns are cut with 8- or 12-pt hobstars. Dorflinger, incidentally, cut the Persian variation of the Russian pattern extensively; the company called the pattern Brilliante.A survey of that portion of the cut-glass literature that contains examples of the Persian variation of the Russian pattern (Russian-Persian) and the Persian pattern has discovered that a number of incorrect identifications have been made over the years, from Dorothy Daniel (1950) to Jane Shadel Spillman (1996). The frequent reader of books on cut glass will discover that Philip MacDonald’s name is often misspelled. Various versions of his name are given in this note, and, although this list is not exhaustive, it probably includes most variations. The note concludes with an argument, necessarily circumstantial, that the correct spelling is MacDonald. The first misspelling occurs with the first mention of MacDonald’s name, in Dorothy Daniel’s book of 1950. It is apparent that Daniel had access to MacDonald’s patent, but probably only to the patent’s illustration (which she did not use). On this page the patentee is identified as “Philip McDonald” and “P. McDonald.” Had Daniel also had access to the patent’s specification page, she would have discovered, and probably used, the patentee’s actual name, Philip MacDonald. Nevertheless, she was aware that the patent was assigned to MacDonald’s employer. This information is found only on the specification page, but Daniel could have obtained it from some other source. Fifteen years after the publication of Daniel’s book, A. C. Revi, copying Daniel, repeated the misspelling of MacDonald’s surname and also managed to misspell his first name, resulting in “Phillip McDonald.” In the same year that Revi published his book, 1965, J. Michael Pearson published his first work on cut glass. Here it is clear that, finally, someone had taken the time to consult the entire MacDonald patent. Although Pearson did not recognize that patent no. 12,982 is not the Russian pattern, he at least spelled Philip MacDonald’s name correctly. Even though the correct spelling of MacDonald’s name was available as early as 1965 — and this was reinforced subsequently in the writings of Jane Shadel Spillman and others — the old misspellings were sometimes used in books published during the 1970s, 80s, and 90s. Perhaps no writer was more determined to misspell MacDonald’s name than the husband and wife team of Bill and Louise Boggess. They began with “Phillip McDonald” in 1977 (they were obviously fans of Revi) and continued to use this spelling until at least 1995. In an unpublished report by Emmerson and Howe (2003), Howe tries to make a case for “McDonald.” As with others before him, he cites the illustration page of the patent. To add credence to his contention, he also inserts the following note (as no. 11) into his account. It is given here in its entirety: “Jane Spillman, Curator of American Glass, Corning Museum of Glass, has advised that his name is listed in the 1880 Census as Philip McDonald, age 32, born in England; and he is not listed in either the 1870 or 1890 Census.” No citation is given but this can only have come from Sinclaire and Spillman (both the 1979 and the 1997 editions of their book, p. 72). The information is correctly quoted except for MacDonald’s name which is given in this reference as “McDonnell (sic).” Howe has changed the evidence to suit his purpose! Mention, nevertheless, must be made that the McDonald spelling does occur in the Sinclaire/Spillman book, on p. 279 where it is taken from a report issued by the AFGWU. The authors make no comment concerning this spelling which occurs in a chapter written by Estelle Sinclaire, not Jane Shadel Spillman. U.S. Patent Office design patents are composed of two parts: the specification page, where all signatures, in final form, are printed, and, the illustration, or drawing page, where all signatures, in final form, are in script. In patent no. 12,982, the MacDonald patent, the error previously referred to occurs on the illustration page: the patentee’s signature, written by his attorney — in accordance with accepted practice — is misspelled “McDonald.” The witnesses on this page are witnessing the fact that the drawing is part of the patent-application being submitted. They are not witnessing the signature of the applicant which, in any case, is always written by the applicant’s attorney who, in this case, has made an error. (On rare occasions, when the applicant did not use an attorney, the applicant himself signed the illustration page.) The witnesses on the illustration page were most likely employees of the law firm used by MacDonald and probably had never heard of him before signing this document. The situation on the specification page is different. Here the witnesses are “local” people. They probably would have known the applicant personally; at any rate they were physically present at the signing. Specifically, in the MacDonald patent it is written: “In testimony whereof I affix my signature in [the] presence of two witnesses.” The witnesses are fellow Corningites. The signature is that of “Philip MacDonald,” not “McDonald.” This circumstantial “proof” should be accepted as part of today’s general consensus that MacDonald’s name is indeed spelled “MacDonald,” and not “McDonald,” until it becomes possible to remove all conjecture by examining MacDonald’s original application to the U.S. Patent Office, or until a document such as his naturalization papers comes to light. The foregoing paragraphs raise several questions concerning the procedure that was followed when an application for a design patent was made during the Brilliant Period of American cut glass. Spillman (1996, p. 180) provides a glimpse of this procedure, but additional research is needed. NOTE (29 Nov 2009): It was noticed on 15 Nov that the Museum has changed its “McDonald” label to “MacDonald,” in agreement with the pattern-name that is suggested in this file. The basis for the Museum’s change is not known. Distinct images, where all of the miter cuts are clearly seen, are essential in order to identify the Russian, Persian, and similar patterns. This is the ideal, but it was not always attained especially during the late nineteenth century. For example, the photograph that accompanies the famous patent application filed by Philip MacDonald in 1882 is especially poor; only by photo-manipulation is it possible to discern the patent’s pattern (and discover definitively that it is not the Russian pattern). Other images rely on drawings where the draftsmen have attempted to reproduce the patterns faithfully by drawing the edges of the miter cuts along with the “bottom of the V cuts.” In addition, the facets of the hobnails are usually shown. These details add clutter that often impairs the visual image. Typical examples include a Scottish drawing and a Burgess patent. We have reproduced these original images, but in some cases, such as the drawings of the Russian and Persian patterns that were prepared for J. Hoare & Company, miter cuts have been darkened, with the result that the images are enhanced. In other situations patterns have been simplified by ignoring the edges of the V-cuts. The patterns are less realistic, but clarity is improved. This individual ice cream plate has been repaired: two staples are visible at the 2 and 3 o’clock positions. 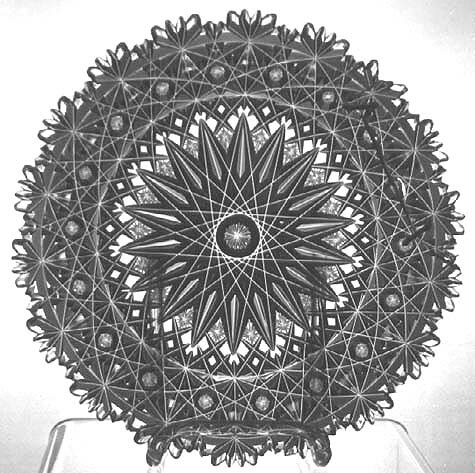 The center of the plate has an 18-pt hobstar with split points and a starred (rayed) hobnail, and there are 16-pt stars between the points of the hobstar. Attributed to the New England Glass Works, c1886, based on the catalog BLOWN AND RICH CUT GLASSWARE, NEW ENGLAND GLASS WORKS (pl. 13, item 36), on file at the Rakow Research Library. D = 7.0″ (17.8 cm), wt = 1.0 lb (0.5 kg). An undamaged set of six of these plates sold for $425 in 1984.